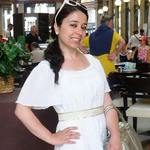 This is a certificated mother-tongue teacher of Turkish language and culture, currently in Ankara. I have been working with three different language schools in Istanbul, and with three in Rome. I completed a program for teaching Turkish as a foreign language at the Marmara University in Istanbul. I am also the Turkish language delegate for Directors Languages based in the UK, and a member of the Turkish team for Innovative Language Learning headquartered in Japan. I have built an exclusive method for Turkish teaching, being a self-language-learner myself. The lessons are adjustable for any kind of journalistic, touristic, romantic, gastronomic, linguistic, scientific, artistic, religious, historical, cultural, commercial purposes; any level from hello to Ottoman poetry; background of any other language, way of learning, means of learning in person or via the Internet, and age. My spectrum of students expands from children to the CEOs. Instructions can be in English, Italian and Japanese. If you are interested, contact me kindly. I hope that we can discover this beautiful language and culture together! Although you are not sure how to say hello in Turkish, my methodology will get you learn all the fundamentals of Turkish language within 15-20 seances. ^Have you already learned the basics but want to put them in practice in order to fasten your speech, correct your pronunciation, or use your abilities in diverse circumstances? ^Are you rather interested in touristic Turkish to provide an efficient communication during your visits in Turkey? -Or any other needs/interests of yours! It is fine if you want to follow up a frequent program, or want to have an advanced level of context. ^Do you have a curriculum for Turkish at an international school or university? ^Are you a foreign student in Turkey? I am experienced in both. I have taught to CEOs from diverse international companies in Istanbul. More colorful lessons with children's music and images! I am quite comfortable with children being an elder sister to both boys and girls. ^Are you a fan of modern authors like Orhan Pamuk and Elif Şafak? ^Are you interested in classical writers and poets like Mehmet Akif, Ömer Seyfettin, Nazım Hikmet? ^Do you want to understand the humanism of Mevlana and Yunus Emre? ^Are you curious about ancient Turkic myths from Central Asia and Dede Korkut? From business to literature, whatever your focus is.